These cheeses are private goods. They are rivalrous, as the same piece of cheese can only be consumed once. 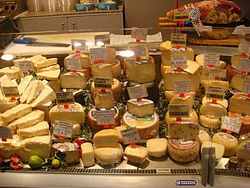 They are also excludable, as it is well possible to prevent someone from consuming the cheese - simply by denying to sell it to them. A private good is defined in economics as "an item that yields positive benefits to people" that is excludable, i.e. its owners can exercise private property rights, preventing those who have not paid for it from using the good or consuming its benefits; and rivalrous, i.e. consumption by one necessarily prevents that of another. A private good, as an economic resource is scarce, which can cause competition for it. 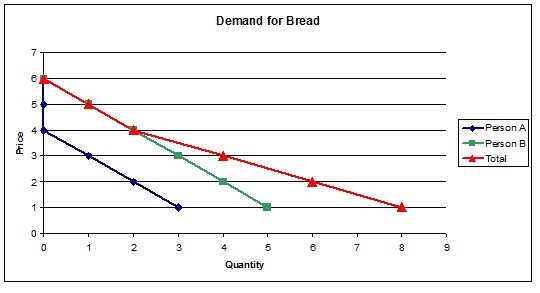 The market demand curve for a private good is a horizontal summation of individual demand curves. Unlike public goods, private goods are less likely to have the free rider problem. Assuming a private good is valued positively by everyone, the efficiency of obtaining the good is obstructed by its rivalry, that is simultaneous consumption of a rivalrous good is theoretically impossible; the feasibility of obtaining the good is made difficult by its excludability, that is people have to pay for it to enjoy its benefits. One of the most common ways of looking at goods in the economy is by examining the level of competition in obtaining a given good, and the possibility of excluding its consumption; one cannot, for example, prevent another from enjoying a beautiful view, or clean air. An example of the private good is bread: bread eaten by a given person cannot be consumed by another (rivalry), and it is easy for a baker to refuse to trade a loaf (exclusive). ^ Nicholson, Walter (2004). Intermediate Microeconomics And Its Application. United States of America: South-Western, a division of Thomson Learning. p. 59. ISBN 0-324-27419-X. ^ Ray Powell (June 2008). "10: Private goods, public goods and externalities". AQA AS Economics (paperback). Philip Allan. p. 352. ISBN 978-0-340-94750-0. ^ Hallgren, M.M. ; McAdams, A.K. (1995). "A model for efficient aggregation of resources for economic public goods on the internet". The Journal of Electronic Publishing. 1. doi:10.3998/3336451.0001.125. ^ "Public Goods: Demand". AmosWEB Encyclonomic WEB*pedia. AmosWEB LLC. Retrieved 23 October 2011. ^ Malkin, J.; Wildavasky, A. (1991). "Why the traditional distinction between public and private goods should be abandoned". Journal of Theoretical Politics. 3: 355–378. doi:10.1177/0951692891003004001.